Corrupt or Crazy? I Need Your Assistance. My Italian and I witnessed an interesting scene in Caracas, Venezuela, dear readers, and even after much debate, we could not conclude what had happened. I’ll outline for you exactly what took place and then please let me know which you think it was. 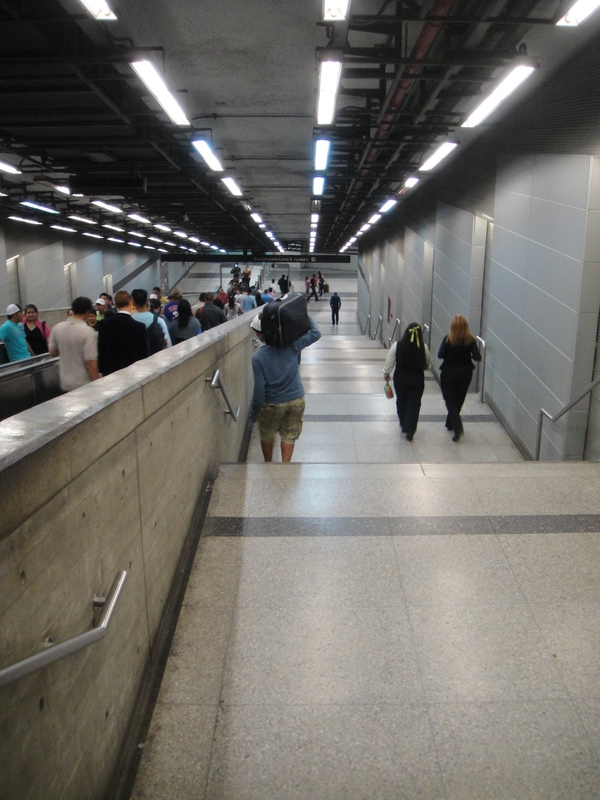 The picture above was taken in the exact spot where the incident took place – a busy subway station in Caracas. So, you can understand the setting perfectly. OK, so we were descending the stairs down to the platform we wanted and there were several average-looking people walking up the stairs toward us. In front was an unshaven man dressed in relatively shabby clothing. If I had to guess, I would estimate that he was in his 30s. At the bottom, two policemen had also just started the walk up. The unshaven man in front had a handful of Venezuelan Bolivars in his hand (perhaps $100 worth) and casually stuffed this money into the space between the railing and the wall. It took him a few seconds to get the money balanced so it would not fall down and then he walked on and didn’t look back. Was he coming back for the money? What just happened? I was going to go and grab it as soon as the approaching policemen walked by. The other people on the stairs passed us and, in hindsight, we agreed that they had seemed excessively friendly. However, this may just be us over-analyzing the situation. None of them even looked at the money. It is quite possible they did not notice it or just thought it was rubbish. Then the two policemen walked by. The policeman closest to the railing saw the money and without looking at all surprised, scooped it up and started counting it. He’d finished counting it by the time they reached the top of the stairs and just put it in his pocket. Was it a bribe? If it were a bribe, it seems like a risky way to transfer the money. Couldn’t they have found a more discreet location to hand over the Bolivars? And if it was a bribe, what was it for? Was the unshaven guy crazy? Even crazy people usually understand the value of money. And he had to have ridden the subway to get there which means he was able to function well enough in society to be out in public, buy a ticket and ride the subway. And if he was crazy, why did he so carefully place the money on the railing instead of just throwing it on the ground? Tags: Caracas, Venezuela. Bookmark the permalink. It was a bribe. The drop was made at a prearranged, public place by a low-level courier. The cops were expected to ignore something; a person, some luggage, an event? It’s a small version of a somewhat similar incident witnessed by my ex in the Bahamas. Two men met for lunch at a popular cafe. Both carried identical attache cases. She noticed the cases under their dining table. Each took the other’s away from the table. A bribe, payoff, casual transaction? Who knows? Justin: you should have grabbed the cash and ran toward the man who left it, hollering “Help! Police!” I’d love to have been there to see what may have happened. Definitely a bribe. George you have a really good point.